QCS Group can manage all aspects of your domain, with website hosting and email all in one place. Please select a domain type to register. I understand and accept the terms and conditions of this service as described in the QCS Group Terms and Conditions. Please select a domain type. Please select a webhosting package. Please select the number of accounts you wish covered. Please Nominate one of the above addresses as the "Catchall" email address. This address will catch all emails addressed to your domain. EG. If someone emails johndoe@yourdomain.com.au and johndoe@yourdomain.com.au does not exist, this email will be forwarded to your "Catchall" so that you won't miss any emails. Please select an email hosting type. Please enter the number of email accounts required. Please use the sliders below to configure the hosted server. 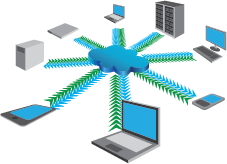 Data traffic allowance is used for when transferring data to and from the hosted server via the internet. Includes backup software for accessing data from the backup server. Web based portal access and encryption. Includes a detailed guide for ease of use. Access your backup data from anywhere with your favourite FTP client.